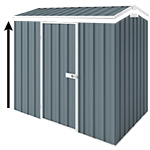 Absco's Utility shed is a great value solution to garage your trailer, boat, car or anything you can think of. This amazing shed features extra large door opening in the gable end, personal access side door with doors braced for strength and security, heavy duty reinforced central and front internal frames. 230cm x 24cm x 8cm and 32kg. For permanent and secure installation it is recommended to use concrete anchor sets. To anchor your shed to your concrete slab you will need 24 anchors for this size.